Goverlan Reach RC makes it easy to start helping users by quickly accessing their machines. The remote system must be equipped with the Goverlan Client Agents, however these agents are automatically installed if needed. The remote installation of the Goverlan Agents requires local administrative privileges on the remote machine. By default, the technician must hold local administrative privileges on the remote machine to initiate a remote control session (this is configurable). If the technical doesn’t hold local admin privileges, Goverlan automatically prompts for alternate credentials. Goverlan Reach Protocol (GRC) Goverlan proprietary access protocol. Allows you to remotely access the screen, keyboard and mouse of a remote machine as if you were physically there. Microsoft RDP Open an RDP session on a remote Windows machine. 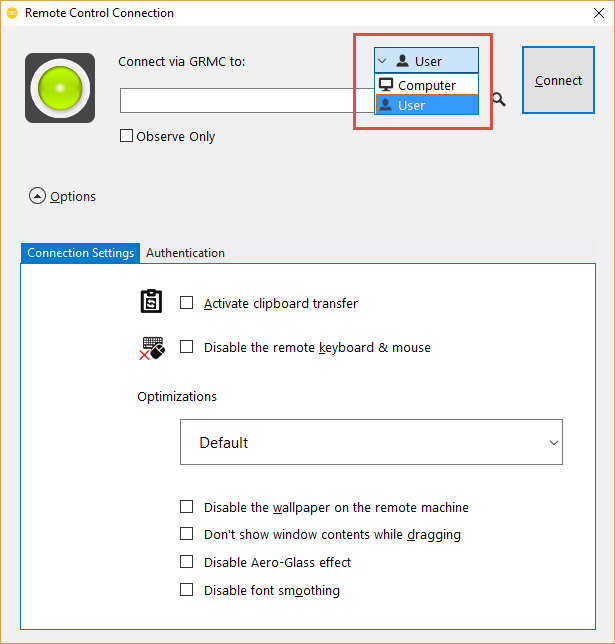 VNC Remote desktop access a Windows, Linux, MacOS X, or any other operating system that supports the VNC Server. Windows Remote Command Prompt Access the command prompt of the remote system without interrupting the remote user, and execute commands. Telnet / SSH Open a telnet or SSH session on any devices. Clicking on the main Connect button defaults to the Goverlan Reach Protocol. To select another access protocol, click on the Other Options bellow and click on the desired protocol. To connect to a system via its name, make sure the Connect To object type is configured to Computer, then specify the computer’s FQDN, shortname or IP address in the Connect To field. It is recommended to use a fully qualified domain name when connecting to a system. Use one or more wild card in the name – For instance, entering NY-SRV-* and clicking on Connect returns all computer records that starts with NY-SRV-. Entering *-SRV-* and clicking on Connect returns all computer records that includes -SRV- in its name. Enter a partial computer name in the Connect To field and click on the search button next to it. Select the desired computer and click on Set focus. 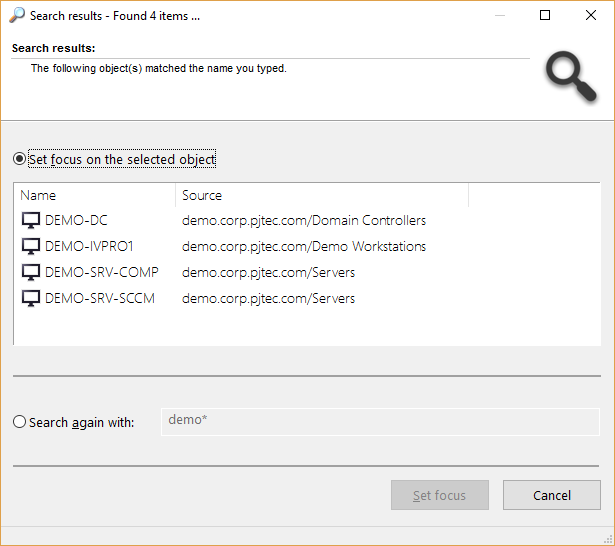 To connect to a system via its logged-in user name, make sure the Connect To object type is configured to User, then specify the user name in the Connect To field. Once you click on Connect, Goverlan searches active directory for user account records that matches the information provided. Once the desired user selected, Goverlan searches for the logged-in workstations of that users and presents you with a machine selection window in the events more than one login session was detected. Goverlan will display a list of log on sessions for that user. These can be any physical session or RDP/Citrix session. For more information about shadowing user sessions see, RDP and Citrix Shadowing. Select the session you wish to control and click Connect. Using Goverlan, you can manage systems over the internet, on-demand or unattended. A Goverlan Reach Server with Goverlan Reach Gateway Services must be configured for this feature to function. Refer to External Device Management for more in-depth information. Goverlan Reach RC allows you to connect to as many machine as needed. Each connection is hosted within its own tab for easy switching. You can also select the All Views tab to monitor the screen activity of all your connections simultaneously. To add a connection tab, click on the (+) button located on the right of your existing tabs. Then initiate a new connection from this tab. The Goverlan Layouts feature allows you to save your connected session information to a file so that it can be reloaded at a later time. Upon reloading, all sessions are automatically reconnected in the order and position you saved them. Saving a layout file – Once you have connected all your sessions, and positioned the Goverlan interface the way you want it to be remembered, click on the Save Layout button, and save the layout file to your disk. You can now close Goverlan. Loading a layout file – Open Goverlan, click on the Load Layout button, open the layout file. Goverlan then reestablishes all connections previously saved. However, this is fully configurable. 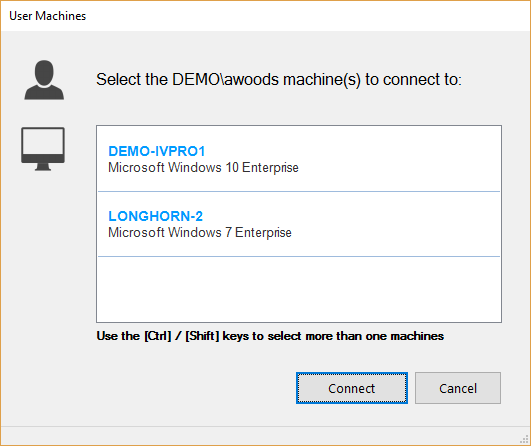 You can configure your client machines to prompt the local user to approve a session before it starts, disable remote control access on some other machines, or remove all visual notification on the users’ side (stealth mode). You can configure additional user notification such as email, or post-session user notification. You can also fully brand the notification messages on the client side by modifying the text or images to your own.